Many first-time travelers choose to spend roughly two weeks in Japan to see and explore the best of the country. That’s why we present you with an optimal itinerary of 14 days and 13 nights, getting to know amazing places and experiences in Tokyo, Kyoto, Osaka, Hiroshima, Fukuoka, and even more! Refer to our “3 days in Tokyo” article, to learn more about how to exchange your Japan Rail Pass and use it on the Narita Express to get to Tokyo’s city center. A fantastic start of your 14 days in Japan would be to visit one of the most colorful and in the same time spiritual temples Tokyo has to offer – the Sensoji Temple. The location of the temple is in Asakusa, where you will also find an immense amount of tiny shopping streets with local treats and surprises. Do not miss on Harajuku, the freakiest, funniest and most diverse neighbourhood of Tokyo. This is the place where young people go wild in any fashion sense possible, the place where you will have the craziest shopping experience and where you can see the drastic evolution of Japanese culture – from the classic temples filled with history to Harajuku – the fashion district. And of course, Shibuya Crossing, the single most popular place to visit in Tokyo. 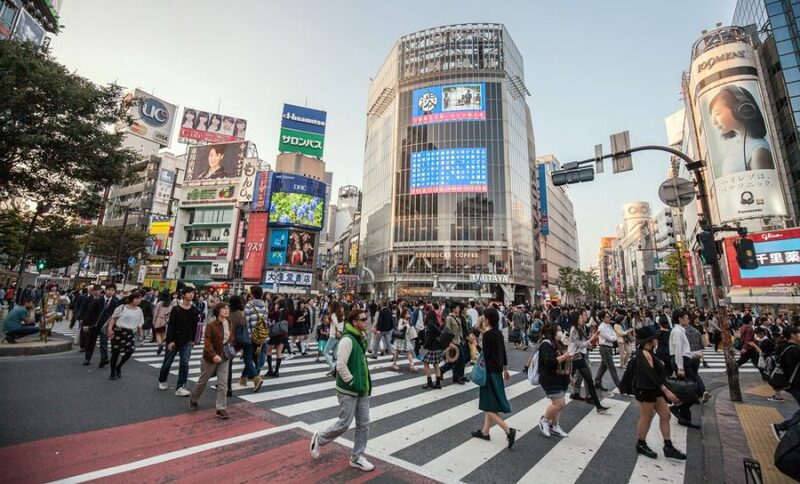 Located in the very heart of the city (the Yamanote line passing by), Shibuya is the perfect location for submerging yourself completely into the Japanese culture and taking the most out of modern Tokyo. Take a walk in the magnificent district of Yanaka – one of the very few places left in Tokyo, where the old spirit, traditional Japanese lifestyle and tranquility have preserved their places over the decades. A very curious street within this region is the Yanaka Ginza street. It is perfect for all cat lovers as the street shops are filled with the presence of these animals. Gyokurin-ji – one of the hidden treasures of the Yanaka district. Visit this ambient temple, which is home to an ancient chinquapin tree. Yanaka Cemetery – surprisingly, the cemetery of Yanaka is a peaceful place, getting many people curious to see the everlasting grave of the famous Tokugawa Yoshinobu, the last of the Shoguns from the Edo Period. If you happen to be in the city during a sumo tournament – we strongly recommend not to miss out on such an event. The Ryogoku Kokugikan is one of the best arenas in the world that to leave you breathless when viewing for the first time a classical sumo fight. Robot Restaurant (Shinjuku stop on the Yamanote line) – The ultimate experience for everyone who hasn’t been served by giant robots, controlled by girls in bikinis yet! This unique experience has driven many international tourists crazy, always with the desire to come back for more. 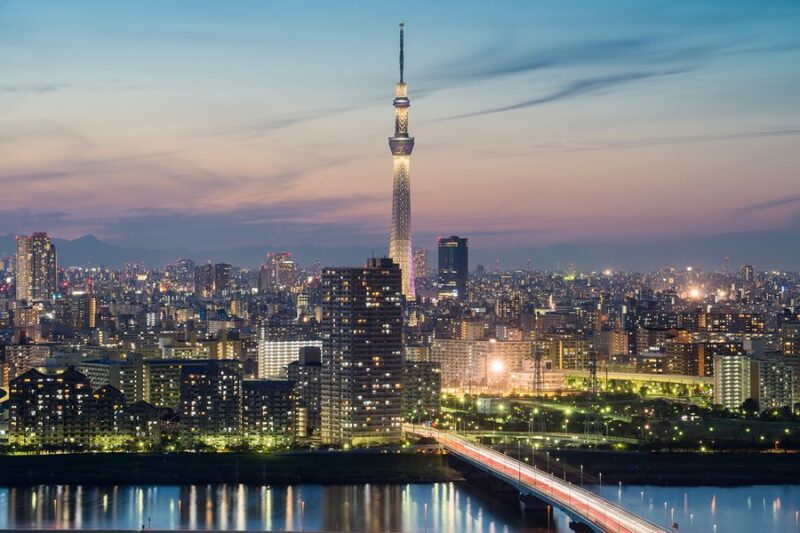 After seeing the many different faces of Tokyo, the grand final should include a view from up above, namely – the Tokyo Skytree. This is the second tallest structure in the world (the tallest one is Burj Khalifa in Dubai), offering mesmerizing sights of the city by day, and magically-inspired views by night. An excellent way to begin your Kyoto adventure will be by visiting the Higashiyama District. This is the best historically preserved place, offering the authentic Kyoto atmosphere, which has maintained its presence over the centuries. The old capital city of Japan is very well reflected between the Yasaka Shrine and the Kiyomizudera Temple, where the narrow streets and wooden shops will take you across the time. Kodaiji Temple – located within the same area, this temple’s secret is the bamboo grove, located behind it. It is there where time stands still, and a stroll through the bamboo forest will feel like a unique experience. Maruyama Park – For its countless cherry trees this park has quickly become one of the most famous destinations for tourists and locals during the cherry blossom period (last week of March – first week of April). Kyoto has had the reputation of being the most beautiful capital of Japan for over a millennium. Even though the honour has now been granted to Tokyo, Kyoto remains the city of daily surprises for the locals and of countless stunning views for all newcomers. One of the most beautiful gardens in Japan is located on the grounds of the Saiho-ji temple. Designed in the 1339, these gardens are heart-shaped, forming a beautiful view and authentic ancient Japanese atmosphere. For a real ancient experience, we recommend visiting Funaoka Onsen – old but remarkably well-preserved saunas (indoors and outdoors), electric baths, stone-lined outdoor baths, herbal baths… There is no end to the pleasures and relaxation you will enjoy by making this one visit. For a full experience, visit the close by Tahitchi restaurant, for a recovering ball of miso soup. Okitsu Club Kyoto – the city of Kyoto, is filled with culturally rich legacies spread all around the area. However, if you wish to understand better and see the core of the Japanese culture, do not think twice and visit the Okitsu club. By providing a comprehensive introduction to the roots of the traditional Japanese culture, this organization will help you to feel part of the elegance and delicacy the old Japanese traditions stood for. Nishiki Market – fresh seafood, traditional Japanese cooking techniques, low prices and great location (3 min walking distance from Shijo Station; Karasuma or Kawaramachi Station) – this is easily the best place to enjoy the local cuisine. 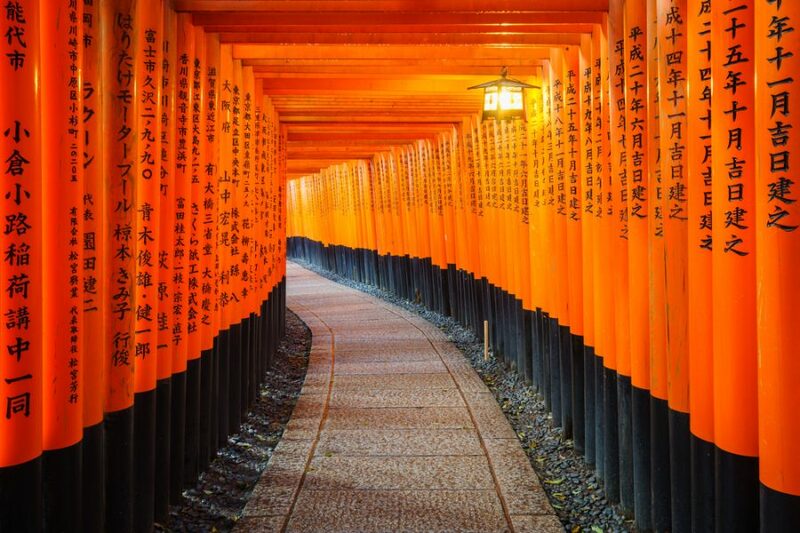 Fushimi Inari-Taisha – This magnificent shrine and the thousands of movie scenes dedicated to this particular place make the spot a must-see for many world travelers. Nanzen-ji – This great temple has played a significant role in the past centuries, has had the title “First Temple of the Land”, forms part of the five great Zen temples of Kyoto and has been taking part of the Kyoto landscape since 1291. The view is something everyone will appreciate for its glory and power. Probably the single most famous temple of Nara goes by the name of Todai-ji. 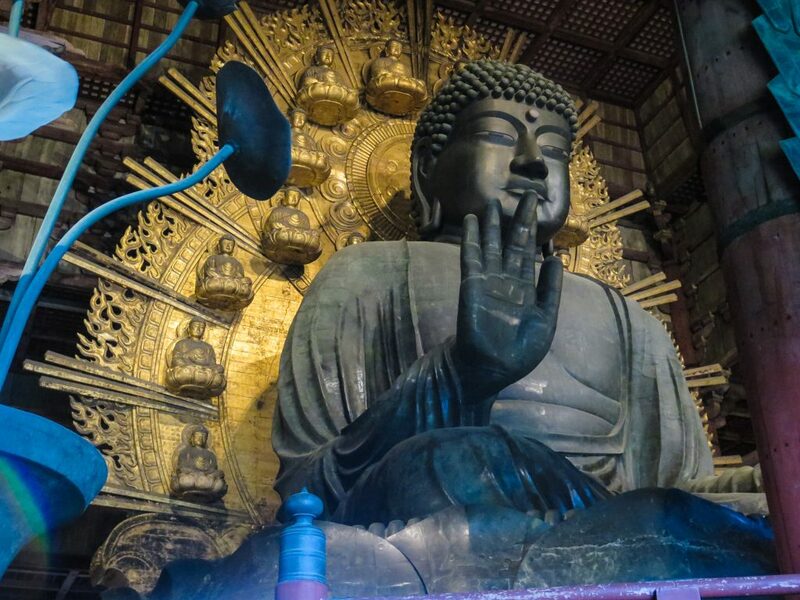 It is where the Daibutsu (the Great Buddha; 14,98m tall; 500 tons) is located. Today the temple still preserves a significant number of national treasures while continuing to be treasure-house for traditional Buddhist rituals. Due to this, Japanese from all over the country come to this temples to pay their respects to the gods and send their prayers. The Nara-Koen park – a place where the open air is united with history, nature, freely walking deers and peace. This park will take you back with all the beauty and serenity Kyoto has to offer. Do not be scared of the animals, as the only thing they might look at you for is some food – however, take note that once you feed them, they will follow you. Nara National Museum – a place where you will be taught about the difference between the two types of Buddhist statues and their history. The Nara National Museum also offers permanent and temporary exhibitions of sculptures, painted art and calligraphy. Lifestyle Museum of Osaka – Located in a ten-story building, this museum offers the experience of Osaka in the 1830s, a typical street with shops, pharmacies, and ancient public baths. To make you feel like you are actually in the Edo period, the museum’s lights recreate the day as well as the night atmosphere. Osaka-jo (Osaka Castle) – The construction of this castle started in 1583 by the general Toyotomi Hideyoshi, who built it with the aim of showing everyone his power, by employing over 100 000 workers for its construction. 600 cherry trees, tea houses, secondary citadels, and impressive gates. are spread along with large open spaces for picnics and walks under the sky. Osaka Aquarium Kaiyukan – One of the world’s richest, biggest and most impressive aquariums. We firmly recommend to visit it at least once, while you are there, as such experiences and fish diversity are very few in the world. Umeda Sky Building – one of the most emblematic buildings of the city, Umeda Sky is 40 stories high, with two twin towers that meet in the middle. This magnificent building offers a 360º view of Osaka from up above – an experience worth living, especially at night, when the city is illuminated. 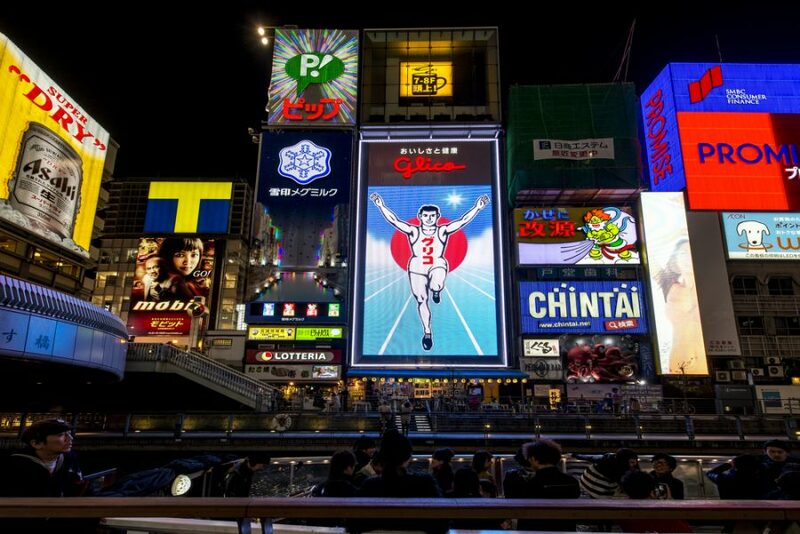 Dotonbori – This is one of the most popular and essential tourist destinations in Osaka. A single street that represents a whole city, Dotonbori has something to offer for everyone with its numerous little and curious shops and tourist attractions. Kuromon Ichiba Market – This is a giant indoor market, whose doors first opened in 1920. The market is located just 10 minutes walking distance away from Dotonbori, which makes it the perfect destination, after a long walk. There you will find everything from fresh/live seafood, fresh vegetables, and meat, making for a great meal, after a tiring day. Hiroshima Peace Memorial Park – This memorial park is dedicated to showing the world how peace can be achieved once again even after enduring a great amount of suffering. The Hiroshima Peace Memorial Park is surrounded by ample green spaces and clear waters; the area is very quiet and the A-Bomb Dome – the symbol of the peace city – impressive, a powerful combination that will make you want to come back. Hiroshima Castle – The castle can be seen from almost any point of the city. To arrive, you will need to take a little walk up the hill and climb the stairs, leading to the gorgeous sight of the Hiroshima Castle – a place where you will be taken back to the samurai times. Mitaki-dera Temple – This is one of the few still hidden gems of the city. The temple has been given its name after the three waterfalls located within its grounds. This is a place of peace and serenity, where you will want to go again and again, always with the same objective – to find nature’s beauty – pure and honest, like nowhere else. Miyajima – the Shrine Island. One of Japan’s most beautiful and popular destinations. Located just a ferry ride away from the coast of Hiroshima (can be reached with your Japan Rail Pass), this picturesque island offers spectacular views early in the morning, during the day as well as late at night. 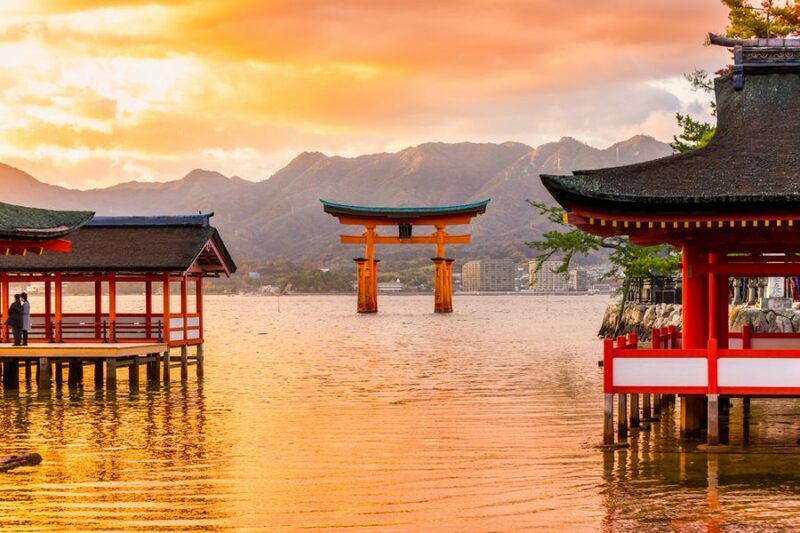 Itsukushima Shrine – One of the few places where the majority of Miyajima visitors say it surpassed their expectations. This floating shrine will leave you breathless during your visit. The centerpiece of this Japanese mastery is the Torii gate, which seemingly floats and opens the gates to the bright blue waters. A single boat ride will make you feel as if the time has stopped, by showing you the beauty and elegance of Japanese architecture. Momijidani Park – Take a walk and spend a few hours in this green wonderland. If you wish to avoid the crowds, do not follow the road going directly up to Mt Misen, but look for the smaller indications. Soon you fill wind yourself in beautiful forests made up of thousands giant trees, offering protection in the rainy days and fresh breeze in the hot summer. Ohori Park – Once a castle moat, this park has the design of a large water garden, around a beautiful pond. Fukuoka Castle Ruins – the area is also known as Maizuru Park, where the remains of 17th-century giant castle remain, reminding of its power and majesty that once ruled over all of Fukuoka. 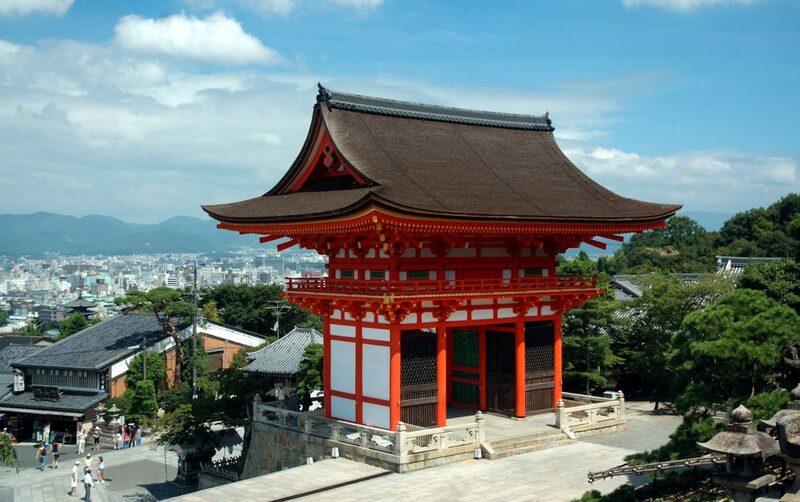 Gokoku Shrine – located near the Fukuoka Castle, the Gokoku Shrine is the city centre of Fukuoka’s modern life. Always busy with Japanese rituals, festivals, and celebrations, this beautiful shrine will amaze you in any season. Tocho Ji Temple – one of the oldest temples of Japan, guarding a 30 ton Buddha and many rare objects that have been collected over the years. Kawabata Shotengai – This is one of the oldest streets in the city. Currently a shopping attraction, going down this street will make you feel like you have gone back in time. Fukuoka Tower – Our classic recommendation for the last stop of your visit – an illuminated view from above, watching over the city of Fukuoka. In Japan, it has become very popular to meet for a date at such high-spaces, which is why this particular tower specializes in an area called Lover’s Sanctuary. Couples can have their names/initials carved on lockets. Finally, on the last day, we suggest you just sit back and relax on your bullet train seat toward Tokyo airports and your journey back home. Note: Do not forget your can use your Japan Rail Pass to take the Narita Express for free. Make sure to reserve your seats before boarding. Need help on deciding which jr pass to buy for this itinerary. Is a 14 or 21 day pass useful or necessary or overkill? The JR Pass gives you unlimited access to all Japan Rail National trains, JR bus services, ferry services, and airport transfers. A 7-day JR Pass only costs ¥29.110 which is actually cheaper than a return ticket from Tokyo to Kyoto on a Shinkansen bullet train. This means that if you make just one long-distance trip you can already save money. If you make multiple trips then you start saving thousands of yen. In addition, when you start factoring in the money you would spend on the metro, buses, transfers, and ferries, then the savings become a must. There are rare occasions when it is not worth buying a JR Pass and it comes down to simple math. As previously mentioned, you only need to make one long-distance trip using a Shinkansen bullet train to save money. A 7-day pass costs ¥29.110 which is ¥4.158,57 per day. If you calculate that your traveling costs would be cheaper if you bought individual tickets for each journey, then it is not worth buying a JR Pass. I have doubts if I should buy or not a 7 day ticket and would like to hear an opinion to decide it. and Nara for 1 day and departure from Tokyo. Hi Lucy! he JR Pass gives you unlimited access to all Japan Rail National trains, JR bus services, ferry services, and airport transfers. A 7-day JR Pass only costs ¥29.110 which is actually cheaper than a return ticket from Tokyo to Kyoto on a Shinkansen bullet train. This means that if you make just one long-distance trip you can already save money. If you make multiple trips then you start saving thousands of yen. In addition, when you start factoring in the money you would spend on the metro, buses, transfers, and ferries, then the savings become a must. Happy travels! Can I purchase JR pass in 5months in advance? Which trains are covered in Osaka by JR pass? What is the cheapest way to get around in Tokyo without using JR pass? Hi Mary! Yes, travelers who wish to purchase their Japan Rail Passes more than 5 months before their intended departure date are free to do so. However, because the validity period of the JR Pass is 3 consecutive months, we at jrailpass.com will pause the delivery of your order until the 3-month validity period is reached. Happy travels! Hi, My Name is Karen. I am a family of 3 adults and 1 child (11 y/o) traveling to Japan starting 02/21/19 and returning home on 03/10/19 (17 day trip). We are looking for some assistance on planning or creating an itinerary for our trip. The main cities we will be traveling to is: Toyko, Osaka, Kyoto and Nara. We some how would like to include Hakone (Mt Fuji) and Kamakura in our trip. We have a list of things that we would like to do and see but not sure where to start. We will mainly be staying in Tokyo and Osaka and doing side trips from these two main cities. 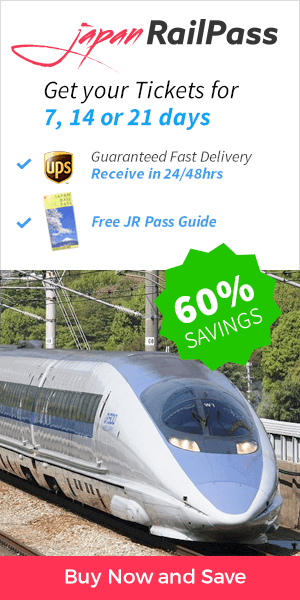 Aside from our itinerary assistance, will the JR pass be the best use of transport for our trip or do you think we should include the shinkansen as well? The Japan Rail Pass allows its holders to travel in Shinkansen bullet trains at no additional cost and hence it would be your best ticket if you wish to travel through the whole country. We are planning to start our Japan’s trip in April 2 -15th from NRT and leaving from ITM Airport on the 16th in the morning. Since its a 14 days trip, we are thinking to spend 4 days in Tokyo, 2 days in Kyoto, 3 days in Osaka, 1 day in Nara, 2 Days in Hiroshima and 2 days in Fukuoka and return back to Osaka to catch our flight. We are not sure if we should buy a 7 or 14 days jrail pass. Do you have recommendation? Hi Kav! 14-day Japan Rail Pass should be cost effective in your case since your itinerary includes both Fukuoka, which is on the southwestern island of Kyushu, and Tokyo, which is located on the main island of Honshu. In addition, when you start factoring in the money you would spend on the metro, buses, transfers, and ferries, then the savings become a must. Happy travels! We are a family of four adults planning two weeks in Japan, arriving Sunday 1 September, leaving Saturday 14 September. Our plan is: Tokyo 5 nights, Miyajima 3 nights, Kyoto 5 nights, and then fly home. 1. Is it worthwhile to buy the 14-day Rail Pass for this trip? Or is it cheaper to buy individual tickets for each journey? We shall also be doing one or two day-trips from Tokyo (Mt Fuji, Kamakura) and one or two day-trips from Kyoto (Osaka, Nara). 2. What is the earliest and fastest train from Kyoto to Tokyo (Narita) on Saturday 14 September? Our flight is at 12:15, so we are wondering if it possible to make the journey from Kyoto in plenty of time to check in? Also, can the Rail Pass be used for this journey? The JR Pass gives you unlimited access to all Japan Rail National trains, JR bus services, ferry services, and airport transfers. A 7-day JR Pass only costs ¥29.110 which is actually cheaper than a return ticket from Tokyo to Kyoto on a Shinkansen bullet train. This means that if you make just one long-distance trip you can already save money. If you make multiple trips then you start saving thousands of yen. 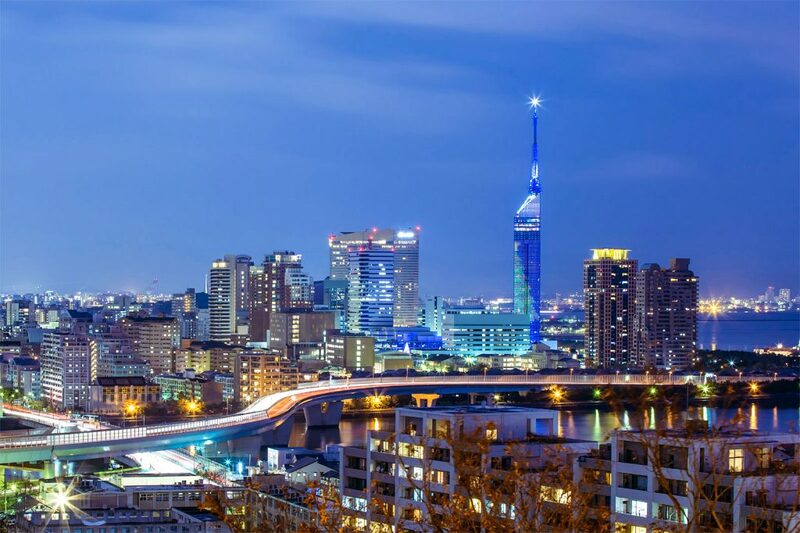 The Narita Express – also known as N’EX – is the most convenient Tokyo city transfer from and to Narita International Airport. It is fully included in your Japan Rail Pass. We would recommend you to travel Kyoto > Tokyo and from there take the Narita Express. Looking at travelling to Tokyo, Kyoto, and Osaka. All up about 2 wks. My family of 6 are planning to travel to Japan next year for 14 days. Our destinations are Osaka, Kyoto, Nara, Kobe, Hiroshima, Nagoya, Hakone/Mt. Fuji/Kawaguchiko, and Tokyo. We decided to book the Japan Rail Pass as this is the most convenient way of transporting us from one place to another. Can you suggest the starting point to the ending point of our trip? Hi Caroline! Our best tips are already on our articles 🙂 please make sure to check all the available routes and itineraries. Do you guys have an application where it only shows us tracks that are covered with JR Pass of 14 days so it’s not complicated to plan the whole trip using the pass? I’m confused what to do if it’s not covered by JR Pass. Hi, I will be travelling with my daughter to Japan in December. We will be touching down Fukuoka on 10/12 and departing from Tokyo on 24/12. It will be a 15 day trip. On route, we will be staying 3 nights in Fukuoka with a day trip to Yufuin/Beppu , 3 nights in Kyoto, 2 nights in Takayama, 2 nights in Kawaguchi and 4 nights in Tokyo. Is it wise to get JR pass? How many days should I get? Hi Jessie! Tokyo is located on the main island of Honshu, while Fukuoka is on the southwestern island of Kyushu. This trip of approximately 1,000km is one of the longest train trips you can make in Japan and even when you split it in different days the distance you will be travelling is huge. In those cases Japan Rail Pass always pays off. We’d recommend you to get a 14-day one and activate it on the second day so that is covers your whole trip. Paying for individual tickets on the first day is not a problem since the transfer service between airport and city is not covered by the JR Pass. Hello! First of all, thank you for all the information on this blog and sorry for my far from perfect English. I’m from Chile, in South America, and on August me and a friend will be traveling to Japan, planning to spend 11 days there. Our itinerary is as follows: from the Narita Airport to Kyoto (3,5 days); Hiroshima/Mijayima (2 days); Osaka (1 day); Nara (1 day); Tokyo (3,5 days). Considering this, should we buy the 7 or 14 days JRP? What would be best cost effective: full JRP coverage or travel the last 4 days (mostly inside Tokyo, and back to the Narita Airport) without it? Is our planned itinerary fully covered by the JRP? Thanks in advance!! Hi Jorge! Since you are staying the last days in Tokyo it is adviceable to make full use during the first 7 days (when you will be travelling bigger distances) to make a cost-effective trip. Your trip can be made fully using your Japan Rail Pass, we strongly recommend you to read this blog in detail to get all the tips! My family (3 adults, 1 child) will be in Japan for 12 days. We plan to stay in Tokyo for the first 4 days, then Kyoto/Nara/Aizomi for 4 days, and finally, 2 days between Hiroshima/Miyajima. Returning back to Tokyo for the last 2 days/1 night. I’m conflicted on whether I should buy the 7 or 14-day rail pass. If we followed your suggested 3-days in Tokyo, for example, will the pass be worth it if I’m not using it every day? We’re flying in and out of Narita. Hi n thomas! The Japan Rail Pass will be useful for the days you will be travelling between locations, and not that useful within Tokyo. Our recommendation would be using a 7-day pass and activate it when you need to travel to Kyoto. Happy travels! I intend to arrive in Tokyo, then travel to Kyoto, then to Takayama and eventually back to tokyo, would the JR pass cover all of these routes? Also, how do I go about booking the trains themselves, is it done online? – If traveling from Kyoto to Takayama, from Kyoto Station take the Hikari or Kodama trains on the Tokaido Line to Nagoya, then take the JR Hida Limited Express (also known as Wide View) from Nagoya to Takayama. – When traveling from Takayama to Tokyo, first take the JR Tokaido Shinkansen to Nagoya with the JR Pass. Use the Hikari rather than Nozomi trains, as the Nozomi are not covered by the JR Pass. From Nagoya, take the JR Hida Limited Express to Takayama. Also please note that your transfers to and from airports are also covered and some local lines in main cities are included too. I will be in Japan for 13 days. I am considering purchasing the 14 day JR pass. I will be staying near Funabashi Station. I was wondering what would be the best way to get from the NRT airport to the Funabashi station? Also, I noticed that the pass covers some of the metro lines in Tokyo. Do you recommend that I still purchase a Pasmo or Suica pass for my time in Tokyo? Should you need to take any lines besides these we recommend you to consider on buying an IC Prepaid card such as SUICA or PASMO. Regarding the easiest way to reach your accomodation, we recommend you to check directly with them since they will be able to provide better information. We will be arriving at Haneda Airport and will stay in Tokyo for 3 days > Mount Fuji for 2days > Kyoto / Osaka for 5 days before we head back to Narita Airport. What option do we have to travel with above routes and any suggestion where we can go in these cities? – From Haneda Airport you will be able to reach Tokyo center in the Tokyo Monorail. – You can reach the Mount Fuji via the Gotemba trail. – Kyoto and Osaka are also connected to the Hakone area through the Hakone Tozan + Tokaido Shinkansen. – Tokyo, Kyoto, and Osaka are connected with by the Tokaido Shinkansen line, included with the Japan Rail Pass. – Finally, Narita Express is the best transportation to get to Narita Airport. You will first need to reach Tokyo and from the city center you will be able to take the Narita Express. Is it possible to make a day trip to Miyajima from Kyoto? A day trip from Kyoto to Miyajima might be too tight but of course it will fully depend on your itinerary and travel plan. To get to Mityajima first you will need to reach Hiroshima from Kyoto and this trip will take you already 3 hours each way. Once you are in Hiroshima, you will be entitled to access the JR ferry from Miyajimaguchi ferry port for free using your Japan Rail Pass, which takes about just 10 minutes. Hi, we are a party of 6 who will be in JApan for 11 days, arriving in Osaka, then move to Kyoto on our own schedule, then move to Kyoto on our own schedule, then to Tokyo on our own schedule, doing sightseeing in each city, before departing from Tokyo. Can we use the Japan Rail Pass for any applicable travel or train transfers? We intend to take a fast train from Kyoto to Tokyo, and then later transfer to Tokyo Haneda airport for our departure out of Japan. What kind of pass do we purchase? Or just some pass that we can just add on and surrender for any remainder on the pass on our way out of JApan? As you were saying, a good option for you may be a 7 days JR Pass and a 3 days JR ticket for Tokyo. Hope you have a nice trip to Japan! Hi, Is it possible to use JP Pass from Kansai Airport to Osaka & Yokohama to Narita Airport? To travel from the Kansai Airport to the city of Osaka, board the Limited Express Haruka at the Kansai Airport Station using your Japan Rail Pass. Take the Haruka to Shin-Osaka Station, a journey of about one hour. At Shin-Osaka, transfer to a local train to Osaka Station. The trip from Shin-Osaka to Osaka takes only three to four minutes. Please check our post about Haruka Express for more useful advice about transportation in Japan. Hope you have a very nice trip! Please help me find the shortest route traveling from sendai to hakata with the JR pass. Thank you. For specific routes, please check Hyperdia website and app. It’s the best tool for this matters. I just realized I should have bought the pass early!! I fly out of Austin TX on Tuesday….can I still get it in time or pickup at the hotel? Help! Deliveries occur on business days within 24-48h hours after shipment. However for your peace of mind we can also send your order straight to your accomodation in Japan so please choose the option that best fits your needs. Konichiwa! If I take a 14/21 days package, where would I sleep at night? Is fooding included in the package ? The Japan Rail Pass is a transportation ticket that grants you access to a wide range of fast-speed, rapid and local trains all over Japan, as well as many bus lines and selected ferry services. Please note this is not a travel package and thus neither fooding nor accomodation are included. I have a question. My family is visiting in May and would visit Kyoto and Hiroshima using JR rail pass. 2. Shin-osaka -> Tokyo. ? Is there any other route which is recommended by you to come back to Tokyo from Hiroshima ? Hello Karthik and thank you for the nice words on our blog post! Indeed, the Nozomi train is not covered by the Japan Rail Pass, as it is not part of the National Japanese Rail group. However, there are other JR Shinkansen services, which connect Hiroshima and Shin-Osaka such as the Shinkansen Sakura train and the Shinkansen Hikari train, which connects Shin-Osaka with Tokyo. The fastest way to get from Tokyo to Hiroshima would be with 1 transfer at Shin-Osaka station, as there is no direct train connection. Hope your family has a great experience in Japan. Is IT possible to go to Kyushu with JR Pass? Yes, you can travel to and across the island of Kyushu using the Japan Rail Pass. The rest of the national train services are fully accesible with the JRailPass. My family and friends will be in Japan for July 5-18. We are planning to visit Tokyo and Mt. Fuji for 5 days. Fukuoka for 3 days, then Osaka for 3 days. Can we use the JR Pass when traveling between the cities? Can you make us a sample itinerary? Any suggestions where else we should go? Thank you! Here is an idea about what you can do in Tokyo for 3 days and how to get to Mount Fuji with your Japan Rail Pass. Regarding the rest of your stay in Japan, here is the perfect Japan in 14 days itinerary. How do you reserve your seats before boarding the train? If you have any more questions, do not hesitate to ask us!